In the build-up to Sunday evening’s Euro 2017 quarter-final against France in Deventer, England coach Mark Sampson insisted the Lionesses could win without playing their best – ultimately, he was proved right. 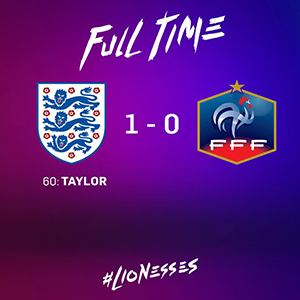 The claim was particularly bold considering no England side had beaten France since 1974, yet Sampson had an ace up his sleeve in the form of the best finisher in Europe, Jodie Taylor and she duly notched the game’s lone goal. The Welshman’s decision to bring Taylor out of the international wilderness upon becoming coach four years ago has proved inspired time and again this month and when the 31-year-old got her only real chance of the game on the hour-mark, the outcome was inevitable. It barely mattered that England looked a shadow of the side that trounced Scotland 6-0 in their tournament opener – they ended a 43-year hoodoo against Les Bleues to set up a mouth-watering semi-final against hosts the Netherlands and, with Taylor up front, appear capable of potentially lifting the trophy come Sunday. While much was rightly made of England scoring ten times in the pool stage – at least double the amount of any other team in the competition – the concession of just a single goal also ensured their defence was the joint-meanest. But there were early warning signs that the previously-impeccable backline could be about to crack under the quality of the French attack in Deventer. Kadidiatou Diani got in behind right-back Lucy Bronze before the Lionesses defence recovered, Marie-Laure Delie was released by an exquisite Camille Abily pass but skewed her shot horribly wide and the dangerous-looking Eugenie Le Sommer failed to spot Diani in acres of space on the left during a counter, denying the pacy winger a clear run at goal. Meanwhile, England’s best chance of the first half came on 21 minutes when Jordan Nobbs flighted a free-kick from the right touchline into the back post and Millie Bright rose highest, but failed to connect properly as her header drifted harmlessly wide. Had Jill Scott seen red, rather than yellow, for an ugly two-footed lunge on Amandine Henry just after the half-hour mark, the complexion of the match could have changed but instead England came out after the break and took advantage. 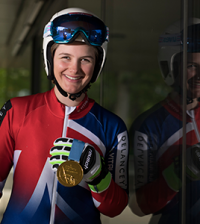 Bronze’s consistent attacking forays finally paid dividends as she slotted Taylor through down the right. The Arsenal star raced into the box and fired into the net, albeit via the hand of French goalkeeper Sarah Bouhaddi. 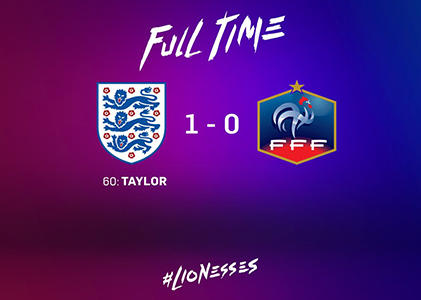 Les Bleues threw everything at the Lionesses in search of an equaliser as Bronze was forced to nod over her own crossbar, Griedge M’Bock Bathy saw her shot saved at the near post after a goalmouth scramble and a Le Sommer cross caused havoc before eventually being hacked clear. But following six minutes of added time, the final whistle blew to end England’s desperate defensive vigil and send them into the last-four.